Grease Seal Double Lip, 1.983"O.D. X 1.249"I.D. Grease Seal Double Lip, 2.332"O.D. X 1.688"I.D. Grease Seal Double Lip, 2.565"O.D. X 1.719"I.D. Grease Seal Double Lip, 3.269"O.D. X 2.125"I.D. Grease Seal Double Lip, 3.376"O.D. X 2.250"I.D. 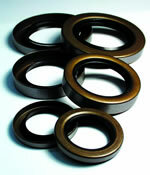 Grease Seal Single Lip, 1.983"O.D. X 1.249"I.D. Grease Seal Single Lip, 1.983"O.D. X 1.372"I.D. Grease Seal Single Lip, 1.987"O.D. X 1.50"I.D.